The newest trend from high-end designers is posh bicycles. And the best part about all of these bicycles is they are cruisers. Because a $17,000 cruiser makes more sense than a $17,000 road bike, right? First we introduced you to the Hermes Bicycle, a dressed up 3-speed Batavus bike with Hermes stitched leather accents for $3,500. And then there was the ultra pricey Chanel Bicycle, which features two quilted flap bags and a jewelry roll behind the seat, all of which are detachable and can be used as individual shoulder bags for a whopping $17,000 (though the two flap bags and jewelry roll is a nice addition). So now I introduce you to the Gucci Cruiser Bicycle, a bike whose price range fits in between the Hermes and Chanel bikes. This is another cruiser sporting Gucci accents all over. The bronze metal frame does look nice with the chocolate Guccissima leather seat, handlebars, seat pack, and pannier. And the price on this bike, a whopping $6365. I am thinking. This is a bicycle, right? Does Gucci placing some leather on it make it a collectors item? Where would you ride this precious bike to? I totally understand spending money on a racing bike or mountain bike, because there is a seemingly understandable point behind it. But a cruiser. I will tell you what, I am not running out to splurge on this bike. And of all of the designer bicycles, I would opt for the Hermes, because it is the CHEAPEST. But I will stick to my $350 cruiser, which gets me around our neighborhood perfectly. 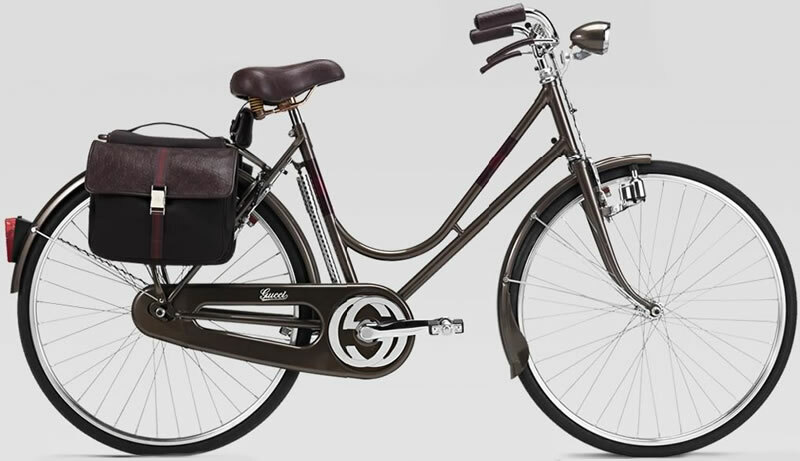 Buy the Gucci Bicycle for $6365 via Gucci.